Shijō refers to a restaurant area in Kyoto that is situated along the Kamo River. It was fashionable on a hot summer evening around the time of the full moon to sit by the river to cool off. This teahouse waitress is depicted relaxing at the end of a day. Her robe reveals glimpses of her red undergarment, which was seen as rather risqué at the time. 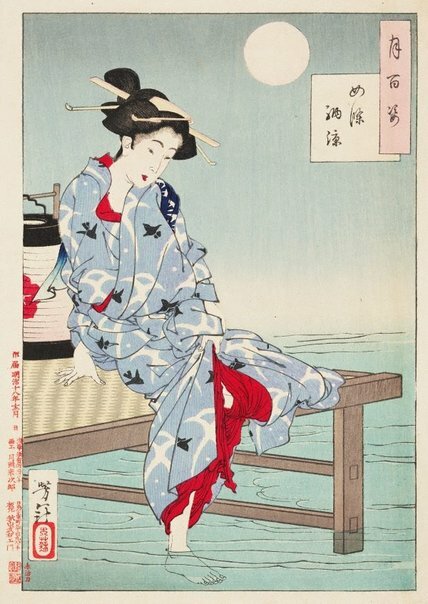 The lamp beside her is emblazoned with the crest of her teahouse and her summer robe has the pattern of 'chidori' ('sea plovers'), the insignia of the geisha from Kyoto’s Pontochō entertainment district.